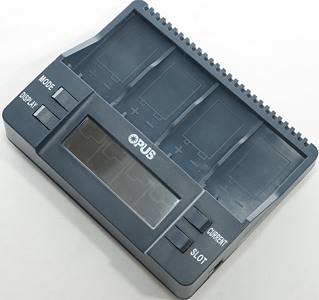 This is the first analyzer for 9V batteries I have seen, it has the usual function from Opus analyzers. I got the charger in a plain white cardboard box, probably because the real box was not ready yet. The box contains the charger, a power supply and a manual. 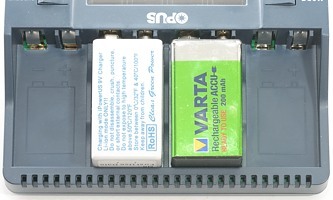 The charger has a barrel connector for 12V power input. As all analyzing charger it has a display and a couple of buttons. During my test I broke one of the buttons, because I pressed to hard. Removing the plastic allowed me to press the button on the circuit board (See IR photos). Self-test during powerup shows all the text on the display. This display is the inverse of the usual lcd displays, the background is black and it is the text that lights up. When working the display looks like this, the DISPLAY button can be used to select what to show (v/h/mA/mAh). 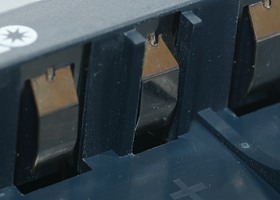 The SLOT button is used to select a single slot, before using the MODE button. The MODE button is used to select mode for one or for all slots, it is also possible to change mode later on. 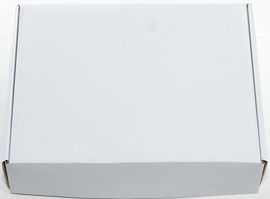 The CURRENT button will step between the possible currents. It is easy to insert remove batteries, with this construction of the charger and it does also provide mechanical polarity protection. 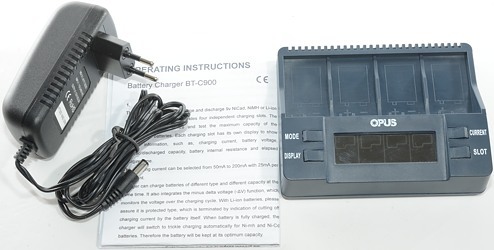 The charger can charger LiIon based 9 volt batteries, but it depends on the safety circuit in the battery to stop the charging. With 8 cell NiMh the charger cannot maintain full charge current. The charge mode can select between 50, 75, 100, 150 and 200, default is 75mA. 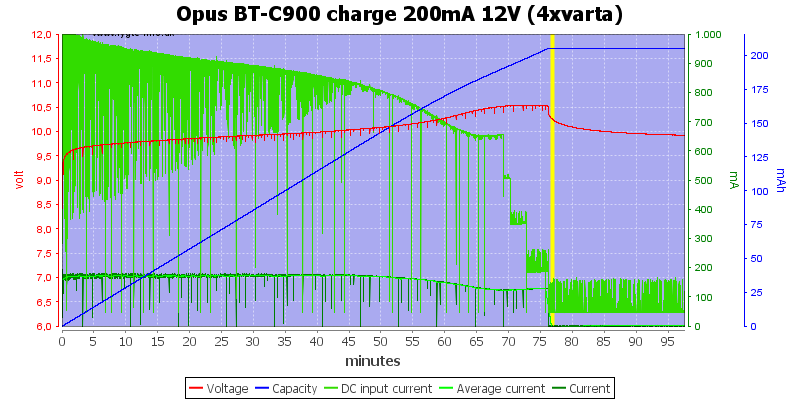 A nice charge curve with -dv/dt termination. 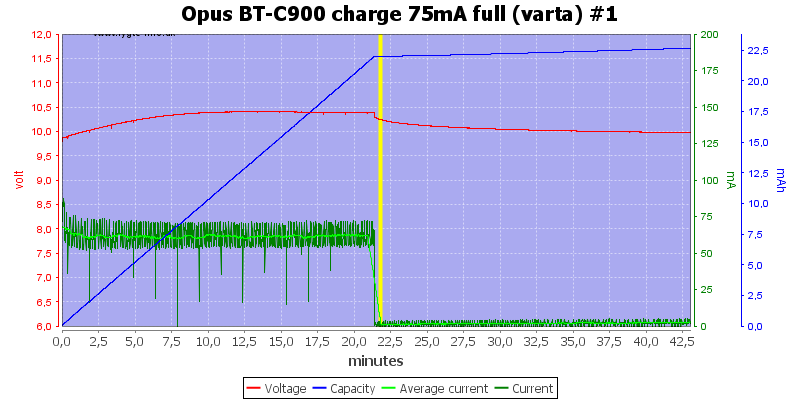 Same with 75mA charge current (It generally looks like the charge current is slightly lower than selected). 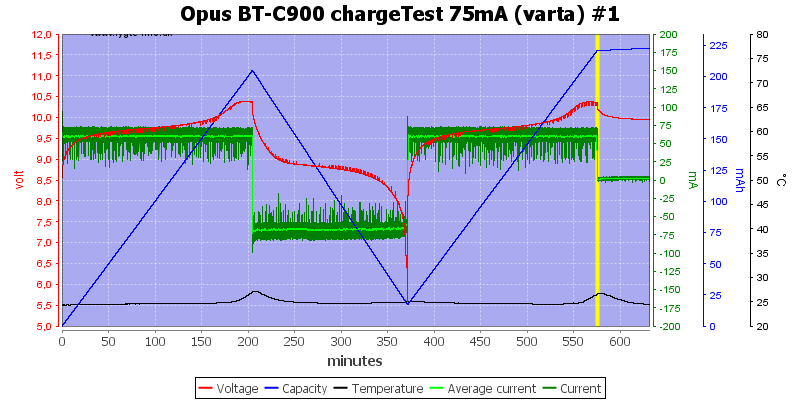 With full charge current the charger reduces the current when the battery is nearly full, but termination is still fine. Detecting a full cell is rather slow. This battery is a 8 cell battery, this means it need about 1.4 volt more when charging. 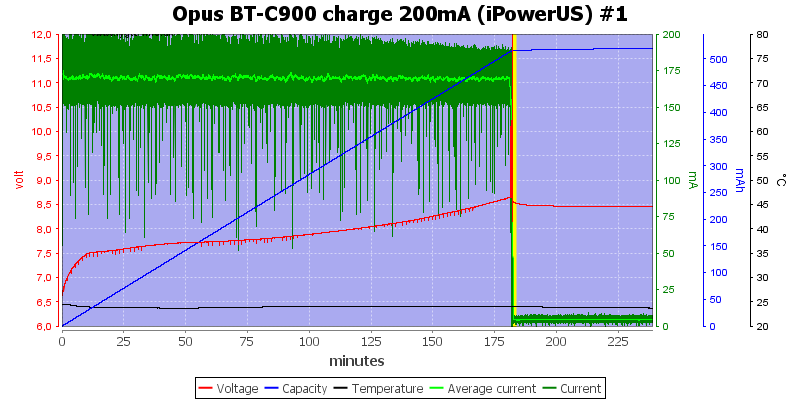 The charger has problems maintaining the current, it gets the cell charged, but maybe it terminates a bit early. The mAh looks to be rather optimistic. 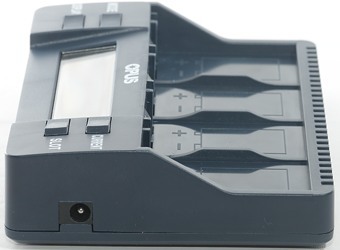 9V batteries does also exist in LiIon versions, the charger can charge them. It do not have any termination, but depends on the over voltage protection in the battery (The red curve jump to 12V when the termination trips). With 200mA the charger has again problems maintaining full current, but terminates correctly. The mAh looks a bit too high. The charger uses about 1A from the power supply when charging at maximum power. 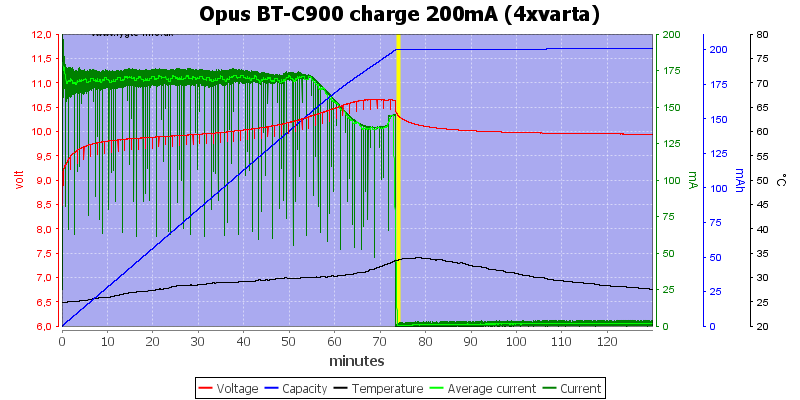 When charging at 200mA it gets fairly warm. The charger is fairly slow to start when power is applied, first it has to run the self test and then wait for any mode and current changes. 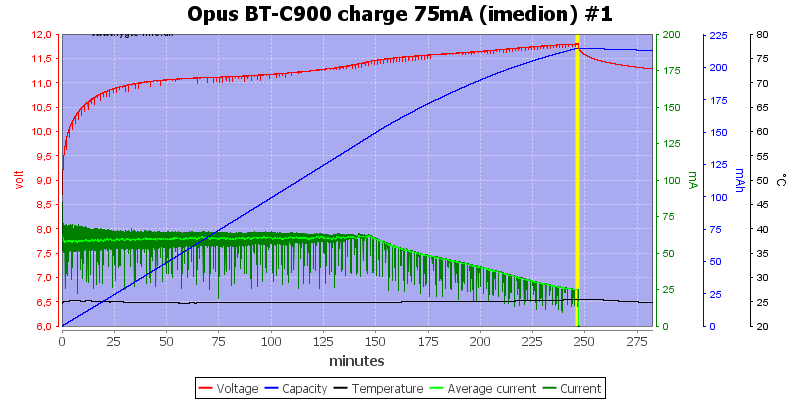 The charger uses pwm to regulate the charge current. Here it is at maximum current. The discharge mode can select between 50, 75, 100, 150 and 200, default is 75mA (This is exactly the same as charge mode). A slow discharge. 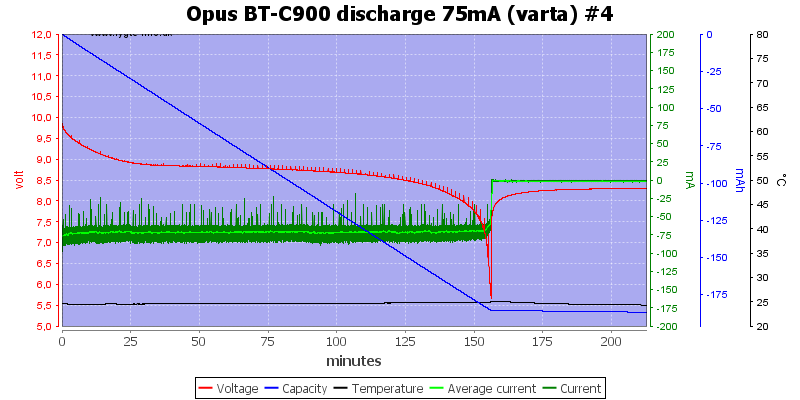 The discharge stops about 5.5 volt, that is around 0.8 volt for each cell with 7 cell battery. All channels looks about the same. For the LiIon cell the discharge stops at 6.4 volt, that is 3.2 volt for each cell, this might be due to the protection in the cell. Doing a 200mA discharge do not sound as much, but with four 9V batteries it is a significant amount of power and the charger gets fairly warm. The charger gets rather warm when discharging four cells at full current. It is probably best not to run all channels at 200mA discharge. 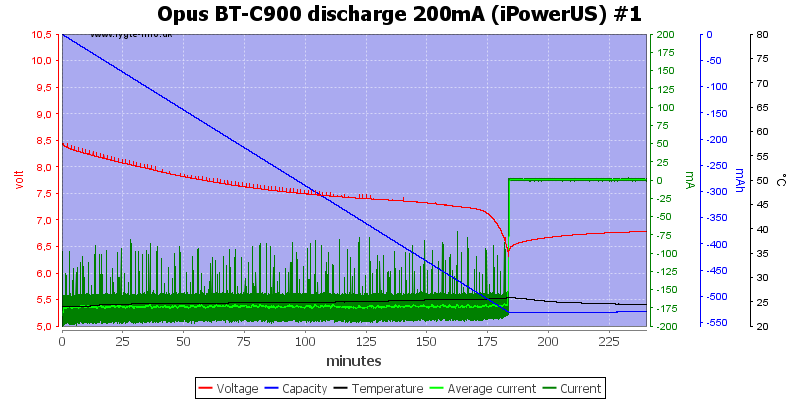 Discharge is also done with pwm. Here I am running at maximum discharge current. 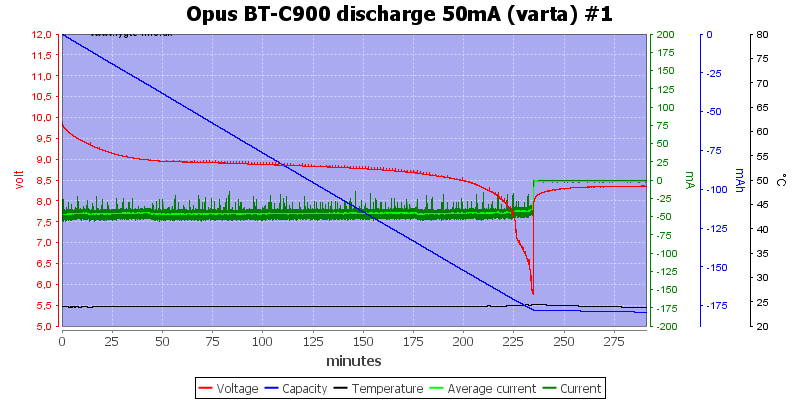 This function will do a couple of charges and discharges. This function will charge the battery, discharge the battery and then charge it again. 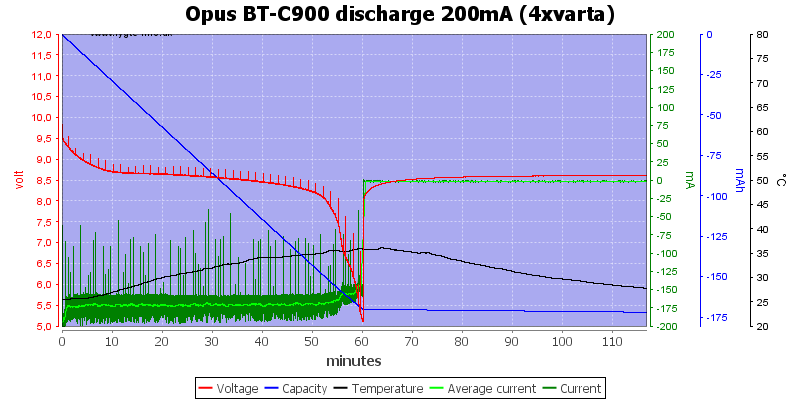 The display will show the discharge capacity and time. 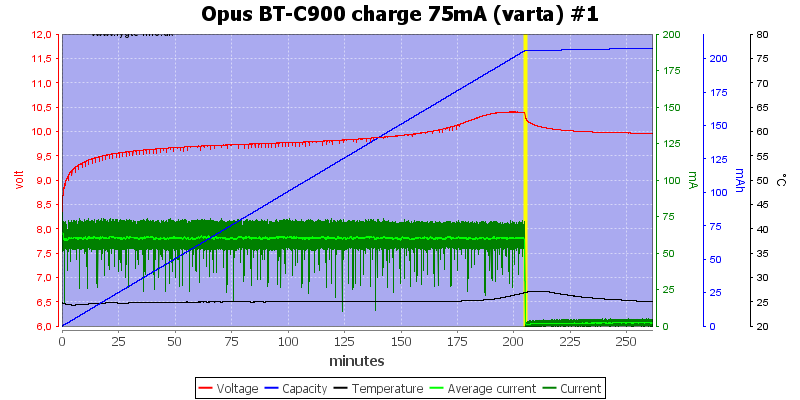 Looks like two nice charge curves with the discharge between. 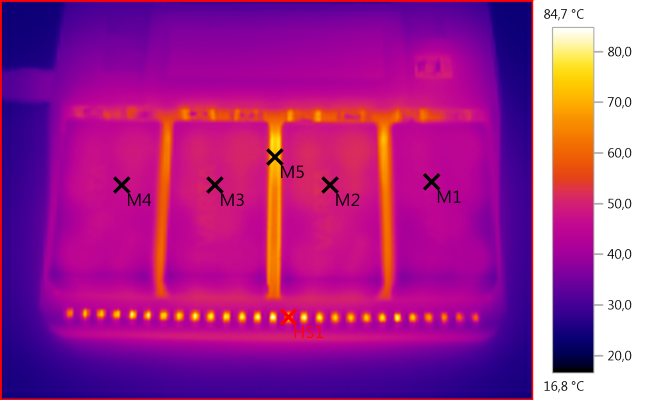 This function measures the internal resistance of the battery, this is an indication of how well the battery performs (Lower value is better). First line shows the reading when I just put the battery in the charger. The second line shows the reading when connected to my test equipment, but without extra resistance. +10, +40 and +100 means I have added that much resistance (Tolerance is only a few mOhm), the result is supposed to show these values. All tests are done with the same battery. 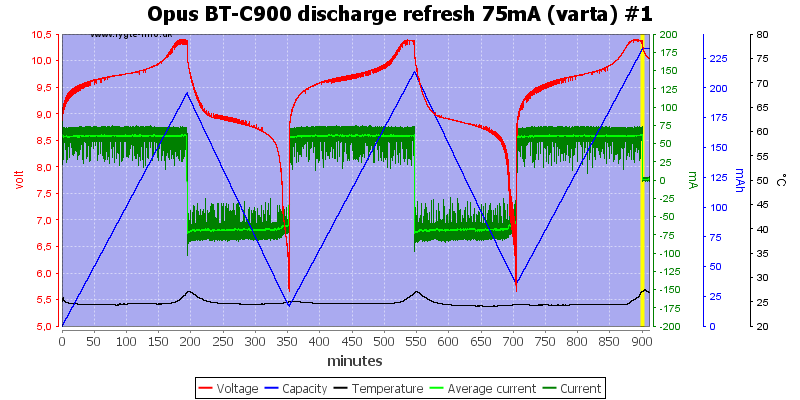 The resistance is measured about 6 seconds after a battery is detected with a single discharge pulse. A far as I know this is the first analyzer for 9V batteries. The functionality is about the same as other analyzers. I works well with the common 7 cell type of 9V rechargeable batteries and can be used for the 8 cell type, but with reduced precision. It can also be used for LiIon 9V batteries, but is not very well adapted for charging them. I would have liked a more robust design of the buttons, but except for that it is good. 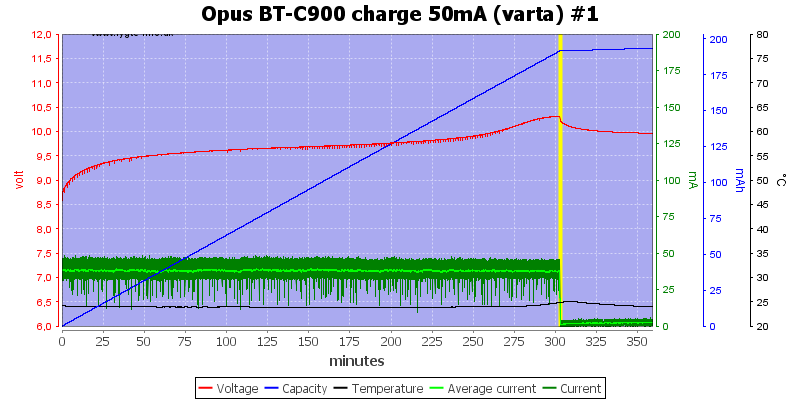 The charger was supplied by Opus for a review. 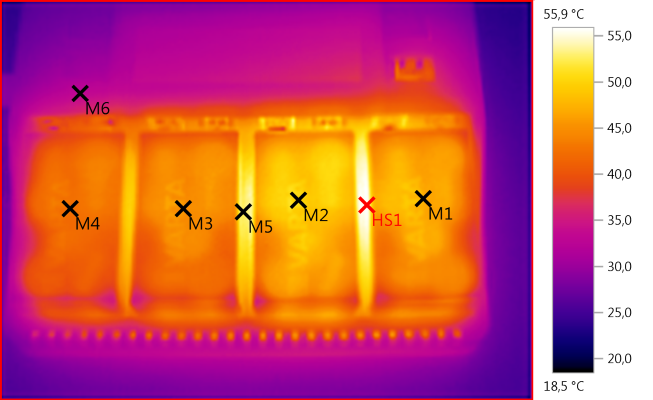 My temperature sensor is designed for round batteries and do not make very good contact on these batteries, i.e. the readings are way too low.